Harrogate Town registered their first win since promotion to the National League when they beat Barnet 2-0 at the CNG Stadium on Tuesday evening. 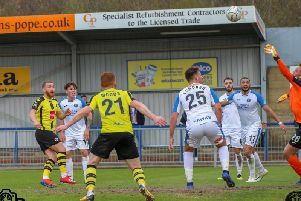 After three consecutive draws, two goals in the space of three first-half minutes proved more than sufficient to see off the Bees, who were relegated from League Two last term. Town made a blistering start and George Thomson tested visiting gloveman Mark Cousins inside the first minute with a low effort from the edge of the box, then fired across the face of goal and past the post after being sent scampering clear down the right by Jack Emmett. Another raid down the same flank saw Jack Muldoon afforded the chance to extend Cousins before the ex-Fylde forward turned provider for Thomson, who again dragged wide of the target when well placed inside the area. The Bees eventually woke up and began to enjoy a spell of possession, Cheye Alexander drilling a 20-yarder just past James Belshaw's right-hand upright. John Still's team could then have snatched the lead with 20 minutes on the clock, but Belshaw raced from his line to superbly deny Shaq Coulthirst one-on-one after Thomson was caught in possession deep in his own half. Despite their slow start, Barnet looked to have forced their way into the ascendancy, only to then fall behind just past the halfway point of the first period. Thomson's cross from the right looped into the air and was only cleared as far as Emmett who curled a beautiful effort past the outstretched hand of Cousins and high into the net from 18 yards out. It was the first time this season that Simon Weaver's men had opened the scoring, and having got their noses in front they added a second goal just three minutes later. Joe Leesley's right-wing corner was met at the back post by Callum Howe and headed across goal for Liam Kitching to nod home, meaning that two local lads had their names on the score-sheet. Kitching almost doubled his tally seven minutes before the interval, but just couldn't quite get enough on another inviting Leesley corner from the right. Town ended the first period looking more than comfortable and began the second similarly well. Just two minutes after the resumption, some neat footwork by from Muldoon enabled him to spin inside the Barnet box, however his finish was wide of the far post. Out of nothing, the North Londoners were then handed a 52nd-minute life-line by referee Simeon Lucas, the man in black inexplicably pointing to the penalty spot as Byron Harrison fell to floor under minimal contact from Howe. The decision was as soft as you're likely to see, and Town will feel justice was done when Coulthirst hit a tame effort too close to Belshaw and the in-form home number one got down to push the ball away. The remainder of the evening unfolded in fairly uneventful fashion, though Belshaw was required to make a good reaction save after the Bees lifted a high ball into the Harrogate box and it deflected goalwards off one of his own defenders. Three minutes from time, there was an opportunity for substitute Aaron Williams to put a gloss on the scoreline and although he stabbed wide of the far stick from Emmett's dinked cross, Town had already done more than enough.